When I woke up on Sunday morning it was 1°C (33°F). Brrrr! I don’t do well with cold mornings, so I knew that I needed a nice, hot breakfast to warm me up. 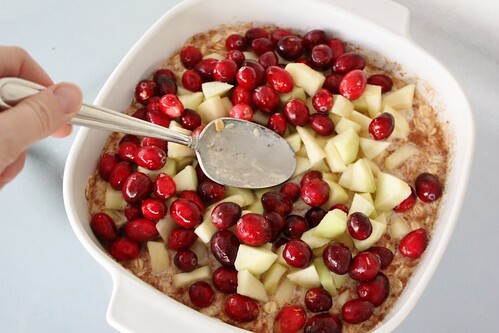 My sister was up for the weekend and she is always saying she misses out on the blog recipes, so I pulled this Cranberry Apple Cinnamon Baked Oatmeal recipe out of the notebook. I’d been thinking about making it for awhile and this was the perfect morning to do so. It only took a few minutes to get it ready for the oven and then while it baked, we talked and talked and talked. That’s usually what happens when we’re together. It was ready in no time. I was so excited when I woke up this morning and noticed there were leftovers. Hot breakfast on a MONDAY! I usually have a protein shake and fruit for breakfast, so having something like this was a real treat. I think I may have to make this on Sundays more often. I like the idea of having breakfast ready for the week. 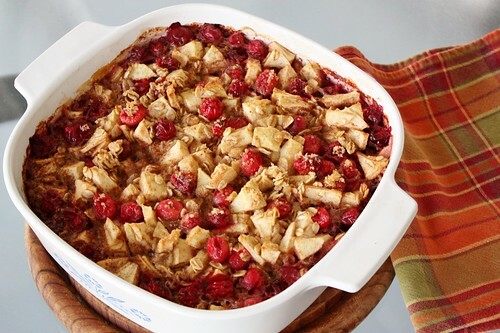 It combines so many of my favourite flavours: tart cranberries, sweet local apples, nutty oats and cinnamon. It made the whole kitchen smell like Christmas was here. 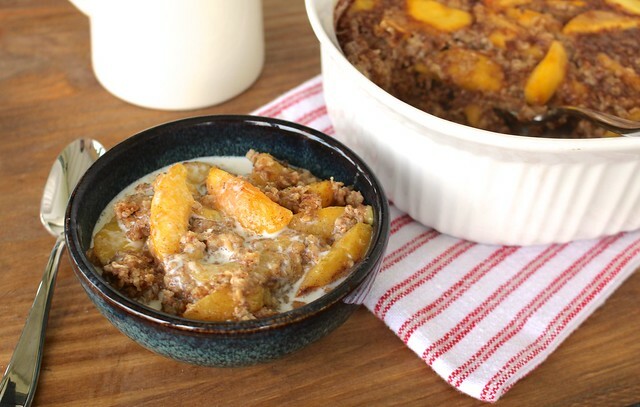 As the holiday season approaches, this is a great recipe to whip up for breakfast when you have overnight guests or if you’re planning a holiday brunch. 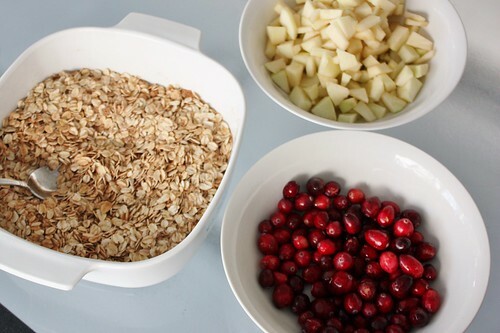 Fold in cranberries and apples. 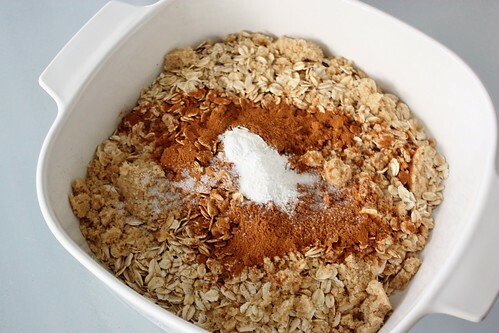 Sprinkle the top with 1 tbsp brown sugar and bake for 40-45 minutes. 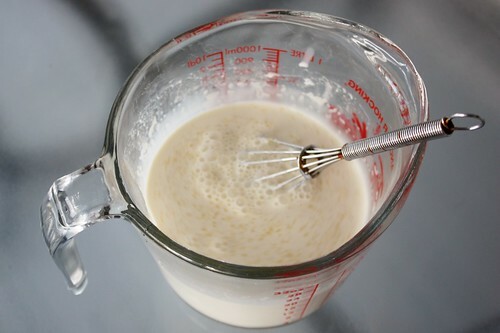 To reheat: add a splash of milk and microwave until warm. Pour wet mixture over dry mixture and stir to combine. 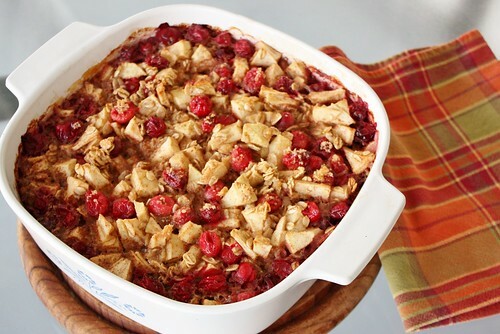 Serve hot and drizzle each serving with maple syrup. 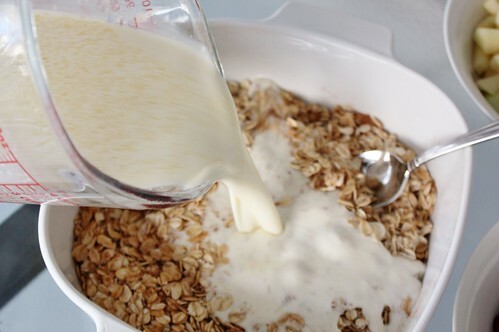 To reheat this baked oatmeal the next morning, I added a splash of milk and microwaved it until warm. Delicious! OH man that looks so delish. It must kill you to wait 40 minutes for it. I’m going to have to try it. 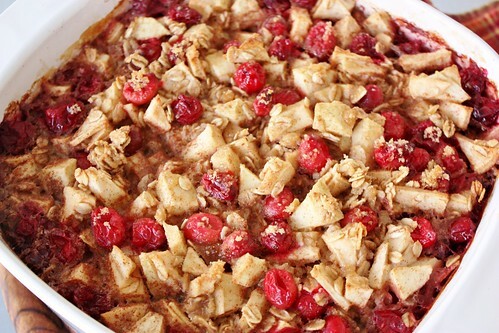 I am SO happy to have found this recipe, and am going to whip it up right now, even tho no one besides me is home to eat it! 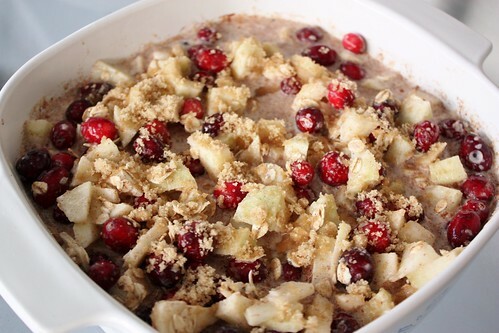 I also love the flavor of apple, oatmeal and cranberries. 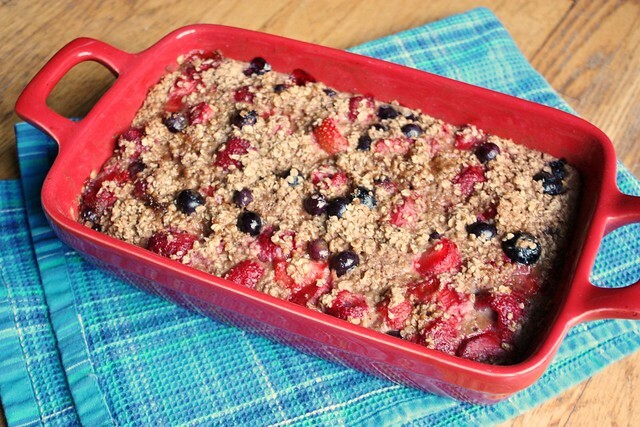 I am a big fan of dessert -for- breakfast kind of meals.